The Invacare Top End Terminator Everyday Wheelchair is a lightweight and cost-effective alternative to a titanium wheelchair. It is built of 6061 T6 aluminum to withstand daily use, and with a variety of custom options, this wheelchair is reliable and affordable. The same craftsmanship that goes into our award-winning Invacare Top End sport wheelchairs can be found in the Invacare Top End Terminator Everyday wheelchair. Custom built to your specifications, this model offers your choice of seat heights, wheels, arm styles and footrests. The chair comes standard with a 250 lb. weight capacity and offers a heavy duty option that will hold up to 350 lb. An ergonomic seat option builds a “sweet spot” that’s especially effective for those who sit in a squeeze of 2” or more. Because it is tailored to your needs, the Terminator Everyday Wheelchair comes ready to roll, with no need for cumbersome adjustments. 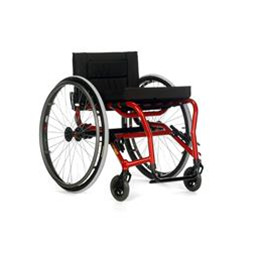 If you’re looking for value and performance, the Terminator Everyday Wheelchair is your top choice. The reimbursement code for this great chair is K0005.